New Vostro – The Third. Dell looks to score with Core-i Hardware, the latest Vostro aluminum design as well as a 13.3-inch screen. 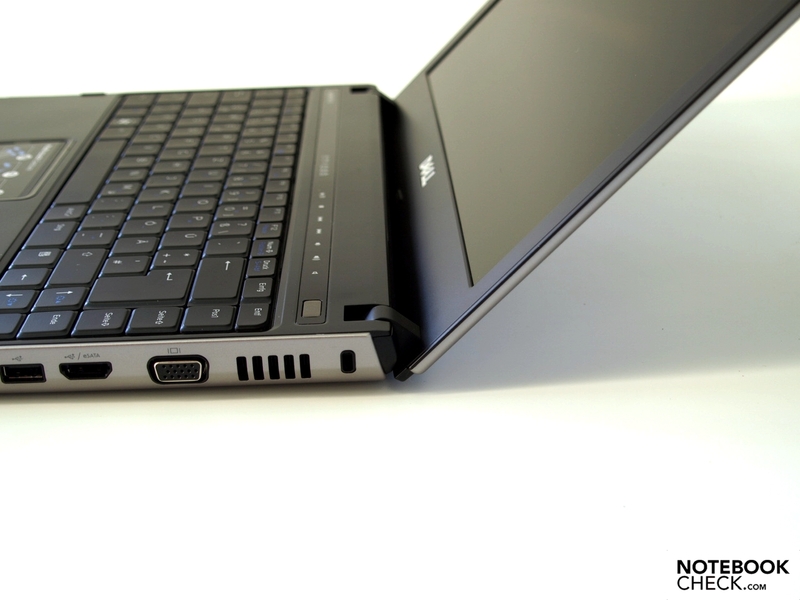 See how the Laptop performs in comparison to others in its class in our comprehensive review. 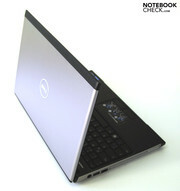 Dell looks to target small businesses in particular with its Vostro Family notebooks. Those looking for a reasonably priced business device with up-to-date hardware, will also find the two already tested, Vostro 3500 15.6-Inch and Vostro 3700 17.3-Inch models alongside the Vostro 3300 13.3-Inch model. Our test laptop is configured with a Core i5 450m processor, integrated with GMA HD graphics chip, three gigabytes of DDR3 RAM and a fast 7200 RPM 320 GB hard drive. 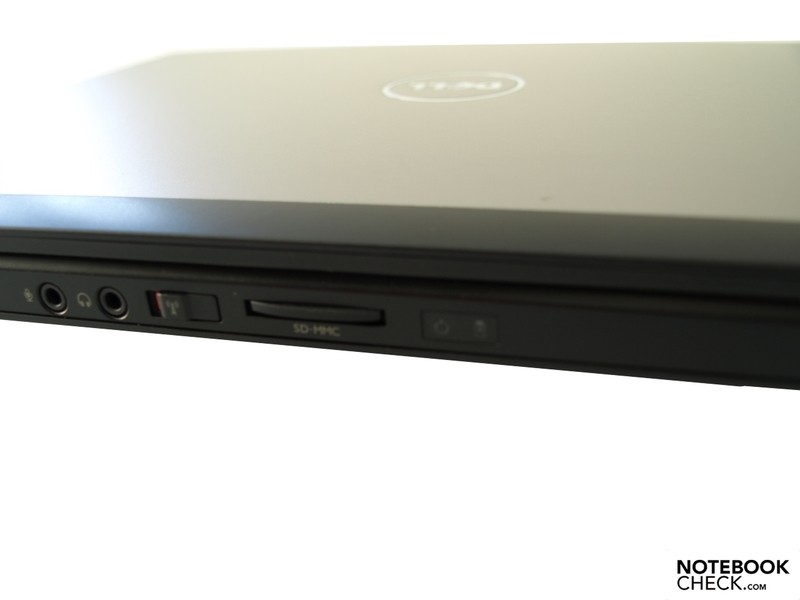 As can be expected with Dell the Vostro 3300 can also be comprehensively configured. The available options will be covered below. Sections like Performance, Emissions and Battery Life which depend strongly on the hardware, aren't necessarily the same if a model is differently configured. 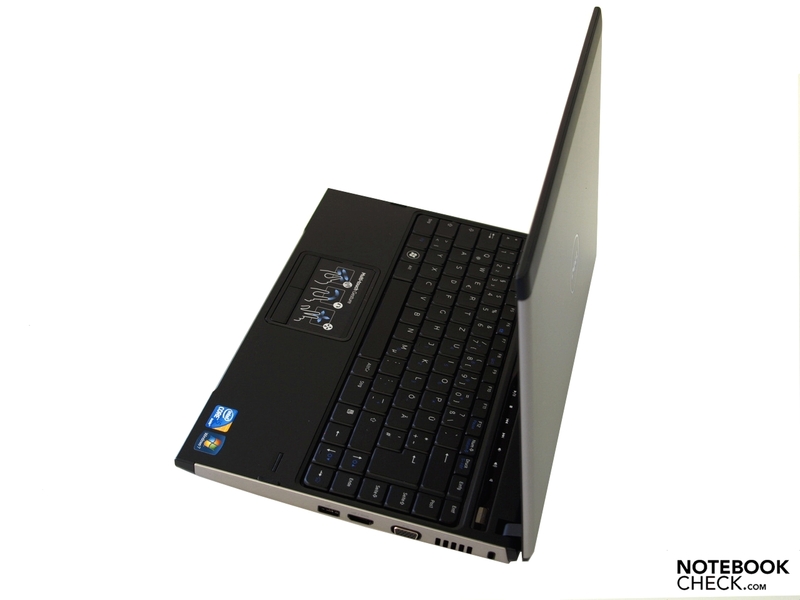 More information and pictures of the Vostro 3300 notebooks can be found in our Short Review. Apart from the interface configuration and its size, the case of the Vostro 3300 basically resembles the larger Vostro 3500. Depending on the region there are three different colors for the display lid and edges to chose from. 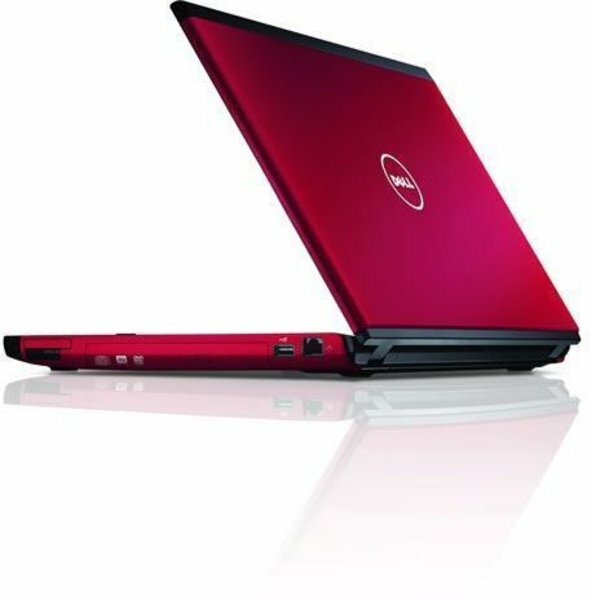 At Dell's online shops for Germany and Austria the laptop is only offered in silver (Aberdeen Silver), just like the one we used. 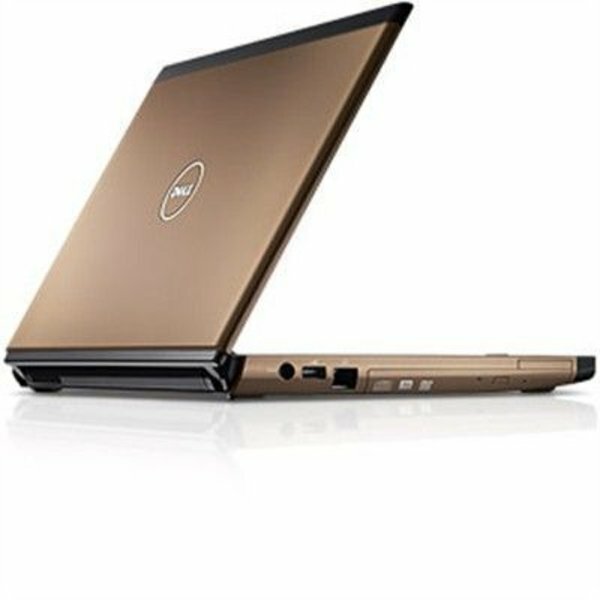 In contrast, at least some of the Dell Vostro Models in the USA are also available in copper (Brisbane Bronze) or red (Lucerne Red). The case itself is made with aluminum and plastic sections and has been meticulously constructed. As far as the stability of the aluminum lid goes, it generally cannot be criticized. When lifting with one hand in the corner the warping is negligible and it was able to withstand our pressure test without any problems. In any case changes on the screen don't occur. Similarly, one can be satisfied with the pressure and twisting resistance of the base unit. Solely around the area of the optical drive is there some give in the casing under heavy pressure. The working area is matt black plastic and the surface has a comfortable feel. The hinges which are attached to the screen limit the opening angle to about 130 degrees which seems slightly limited. In jerky work environments, during a train ride for instance, the screen vibrates considerably, as well as teetering considerably after adjusting the opening angle. The free moving hinges allow easily for one handed opening and adjustment. 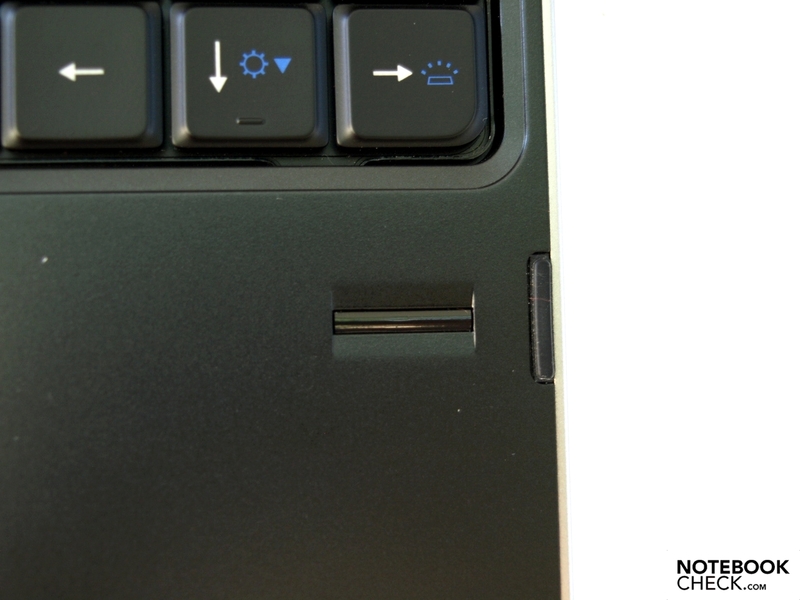 Given that you will need to do without a transport lock, and, that the tension provided by the hinges isn't enough to hold the lid down and keep the laptop securely closed, watch out that no foreign bodies get between the keyboard and the screen during transportation. The dimensions of 325 millimeters wide, 229 millimeters deep and a height that increases from 20.1 mm at the front to 28.1 mm at the rear aren't that different from other 13.3-Inch notebooks. 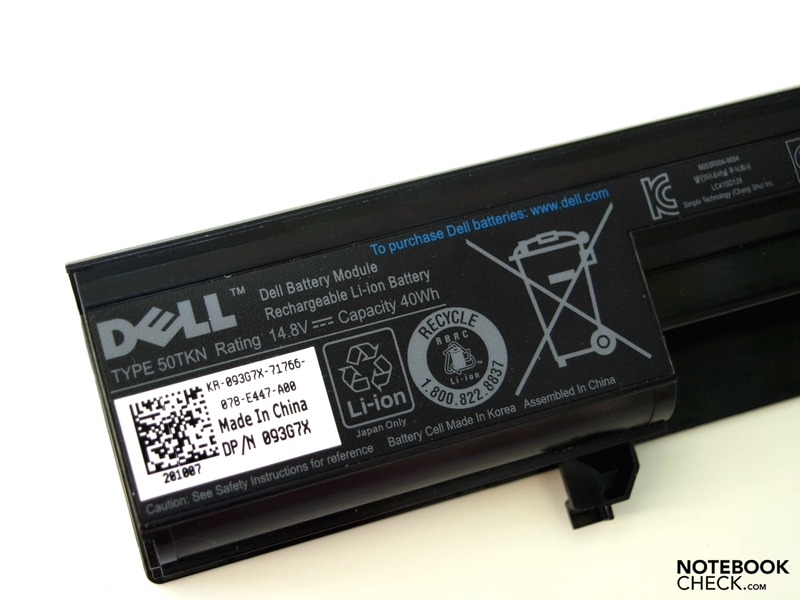 The laptop weighs 1.93 kilograms with the battery. Added to that is an additional 0.35 kg for the adapter, so the carrying weight is kept within a fair limit. 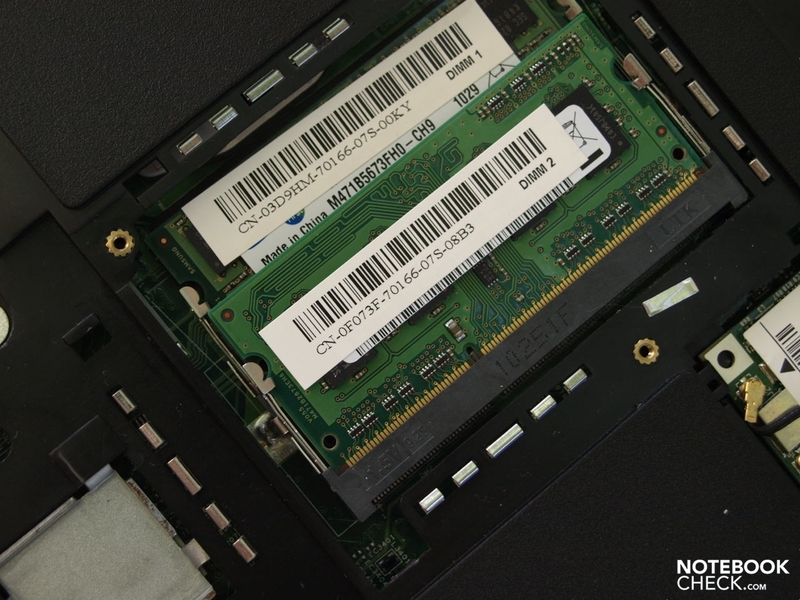 Due to the compact chassis, the Vostro 3300 does without a number of connections in comparison to the 15 incher. First of all it has not got a digital image port. 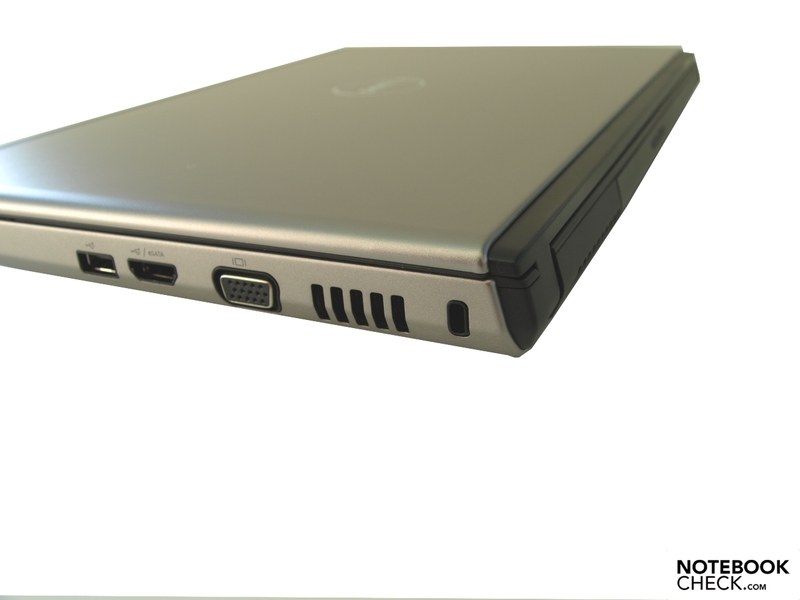 Furthermore, as is common with 13 inch models, the Vostro 3300 has only 3 USB 2.0 ports for the connection of peripheral devices, for example printers or an external mouse. One of these implements a USB-eSATA combination, so that connection with external devices achieves better transfer rates than are possible with USB. Due to the opening mechanism and the battery the rear edge remains unused. 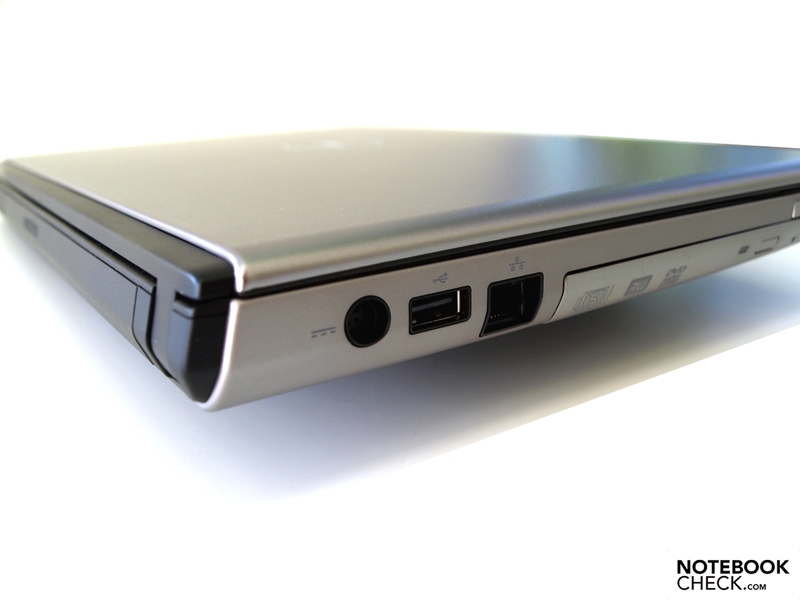 In contrast the front edge sports a 5-in-1 card reader, the main switch for the wireless function and both of the audio ports. If you demand more functionality you can upgrade certain functions using the Vostro 3300's ExpressCard/34. 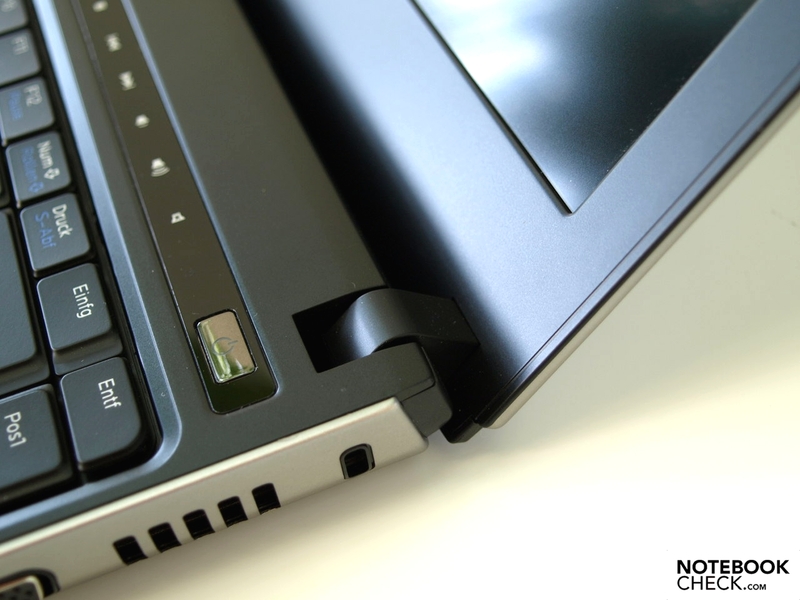 In any case, there is no dedicated docking port, which are normally customary in most business laptops. 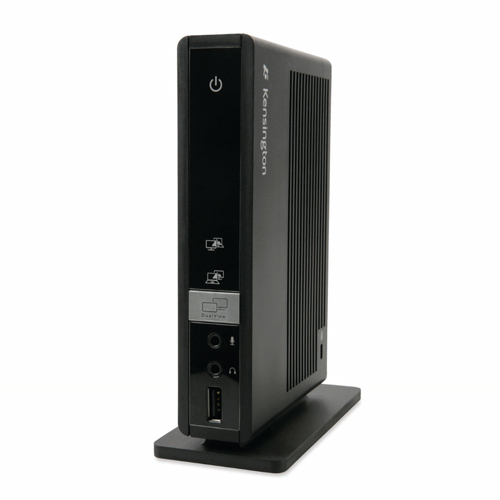 In lieu thereof are the options of USB-docking-solutions, such as the Kensington SD100 USB Port Replicator for around 60 Euro or the Kensington Universal Dock for around 140 Euro in Germany. This simplifies connecting the device into an existing network and extends the connectivity. 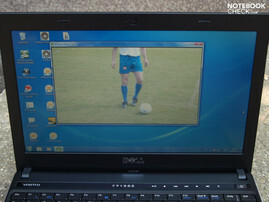 The latter also provides a digital image connection in the form of DVI-D. The composition of the interface takes into account both left and right hander’s in consideration of the available usable space. In any case, the positioning of the combined ESATA/USB-Port in the middle of the right side is less optimal for right handed users. In relation to communications equipment and accessories the Vostro 3300 doesn’t differ from the Vostro 3500. 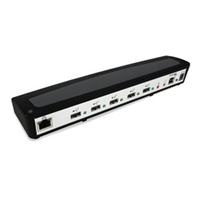 A wired LAN connection can be set up with the Realtek RTL8168D/8111D Family PCI-E GBE NIC (10/100/1000MBit). Via Dell‘s Wireless 1520 Wireless-N Half Mini Card you can gain access to WLAN networks. It also supports standard 802.11n. In certain countries the Dell Wireless HSPA 2.0 Minicard is also available as an extra option. 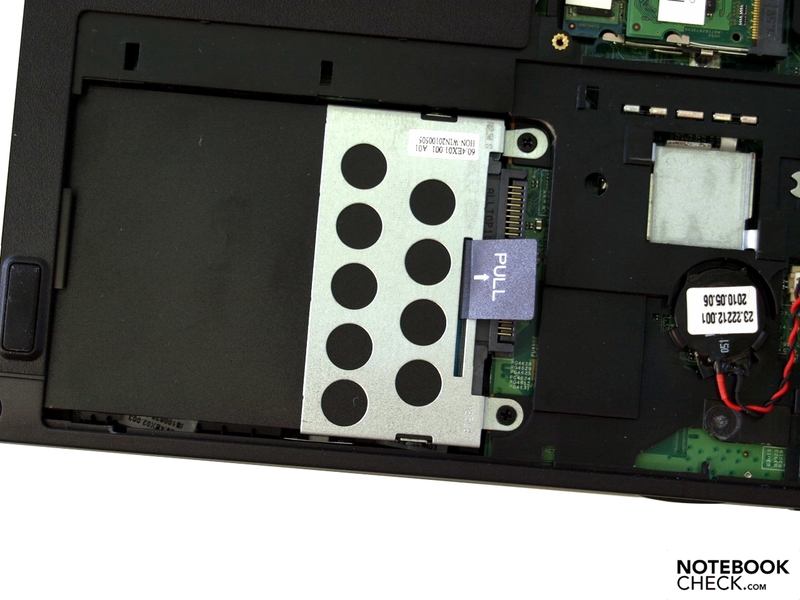 The SIM card slot can be found in the battery compartment. However, at the moment this option is not available in Germany. With the 2.0 MP Webcam internet video conference isn’t at all a problem. 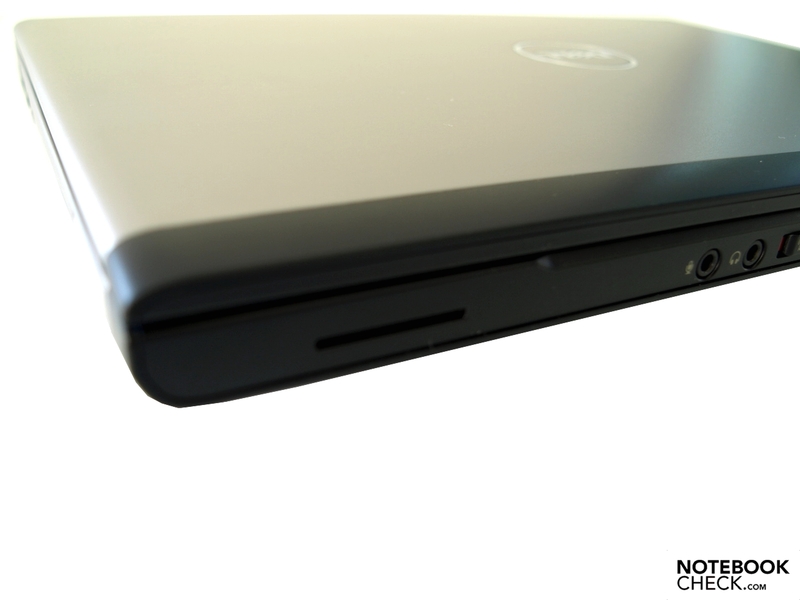 Finally, you have the option of exchanging data with mobile devices via bluetooth using the Dell Wireless 365 card. Our test machine came with Windows 7 Professional 32-Bit pre-installed. You can also choose for your Vostro 3300 to come with the 64-Bit version although this will incur an additional charge. Optionally, you can choose to downgrade to pre-installed windows XP Professional, which Dell will charge 35 Euro for. 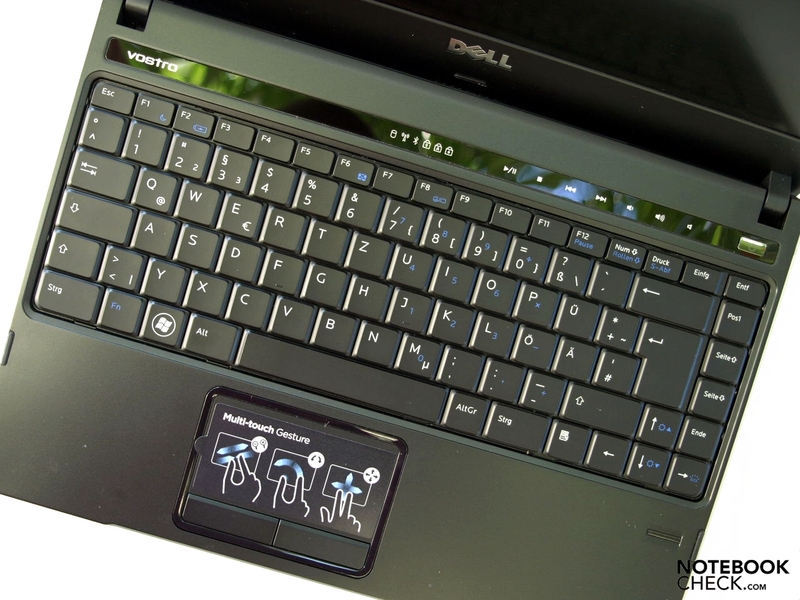 Dell intends to stop offering this option on 23rd of September 2010. A 32 bit operating system will do for the 3 gigabyte RAM built-in factory. But if you want to upgrade the main memory, a 64 bit version is recommended. In addition to a Kensington Security Slot, which can be employed as an anti-theft device, the Vostro 3300 also has a fingerprint reader at its disposal. So instead of entering your password manually you can simply scan your finger. 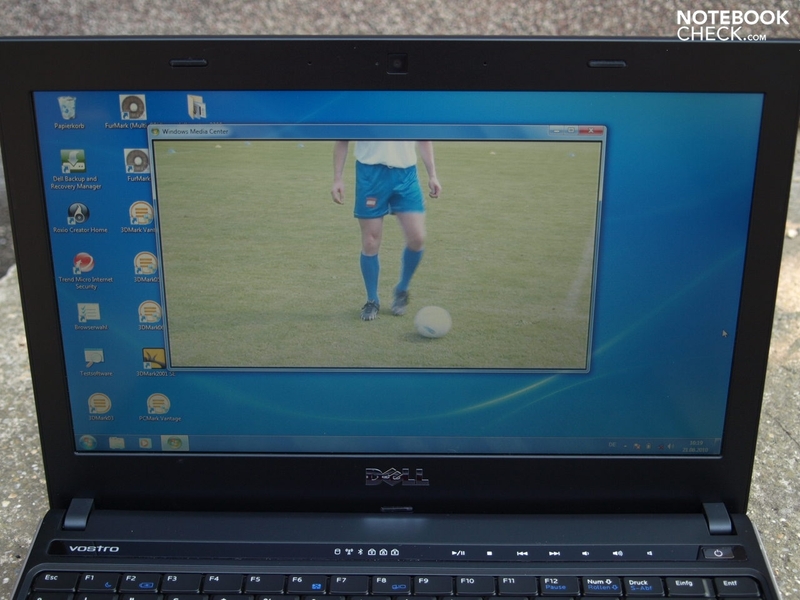 In the test laptop’s carton, you'll also find an operating system, as well as driver and tools DVDs. 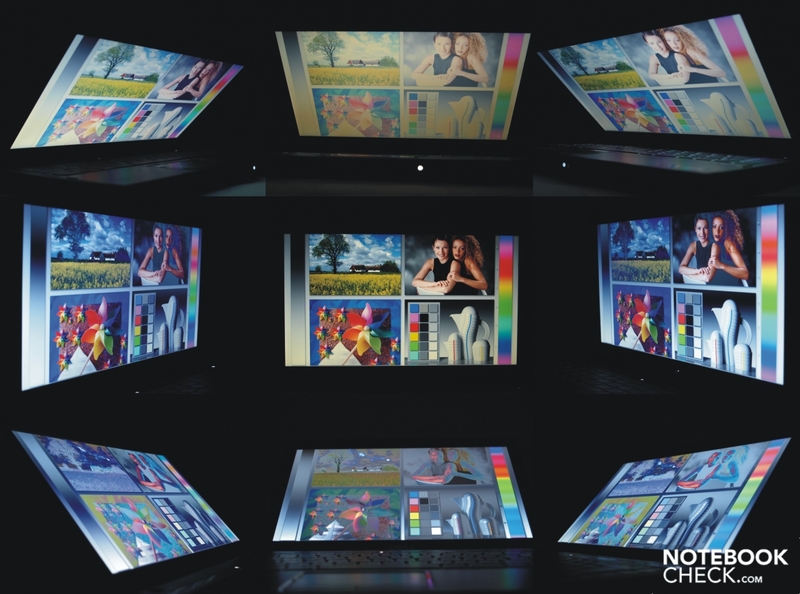 In addition you can create these with a Dell tool without much issue. 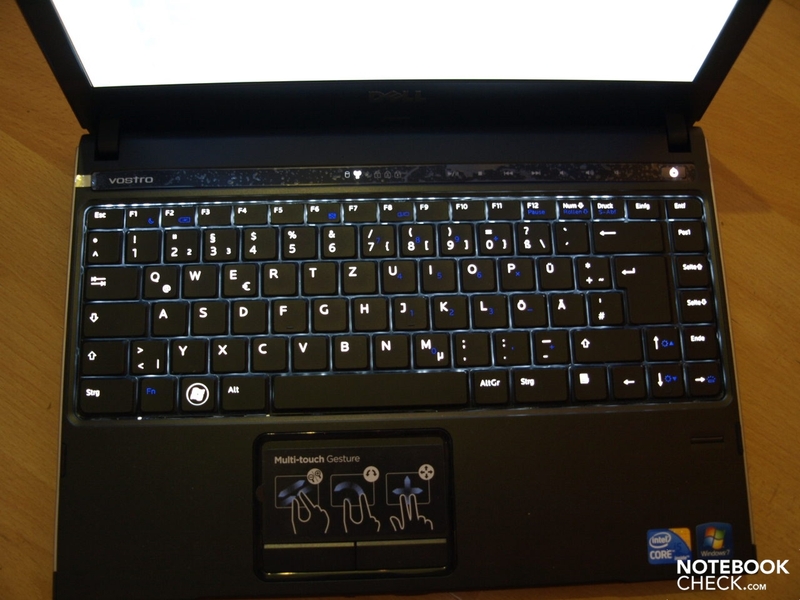 The input devices don’t differ greatly from those in the Vostro 3500. The impression and the assessment are therefore in line with this. 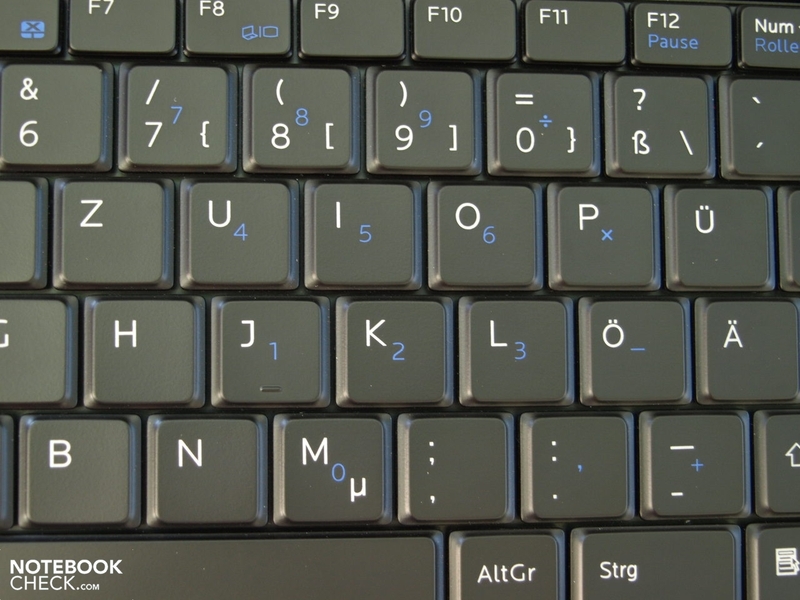 A standard layout without specific key groups and with good mechanical traits, a distinct pressure point and a rather long length of stroke, make for error free touch typing from the off. Nevertheless, the substructure does tend to give a bit if you type energetically. The sound does keep within acceptable limits though. Fortunately the keys are a comfortable size, although they have a completely flat surface. 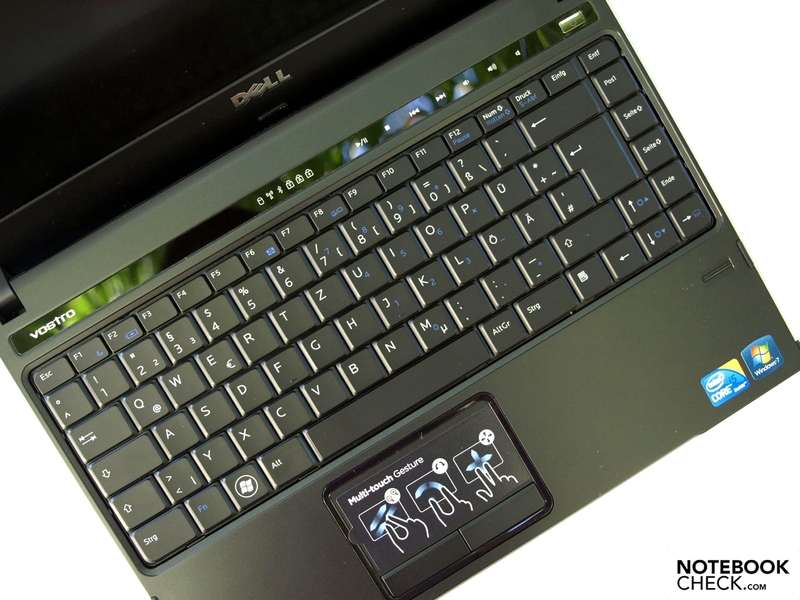 The keyboard is splash water protected in order to avoid damage from spills. The optional, two tiered LED light was added to our test laptop and allows for use of the keyboard in dark or dim work environments. Above the keyboard are touch sensitive fields which control the multimedia functions. White LEDs are used to show their activity. Similarly, white LED’s are used on the left to show the system status. The LEDs aren’t striking, and in strong light are hardly visible. 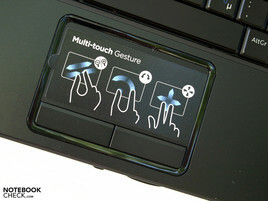 The touchpad supports multi-touch gestures. Just as, when scrolling, one can revert to using the marked vertical and horizontal scroll bars. 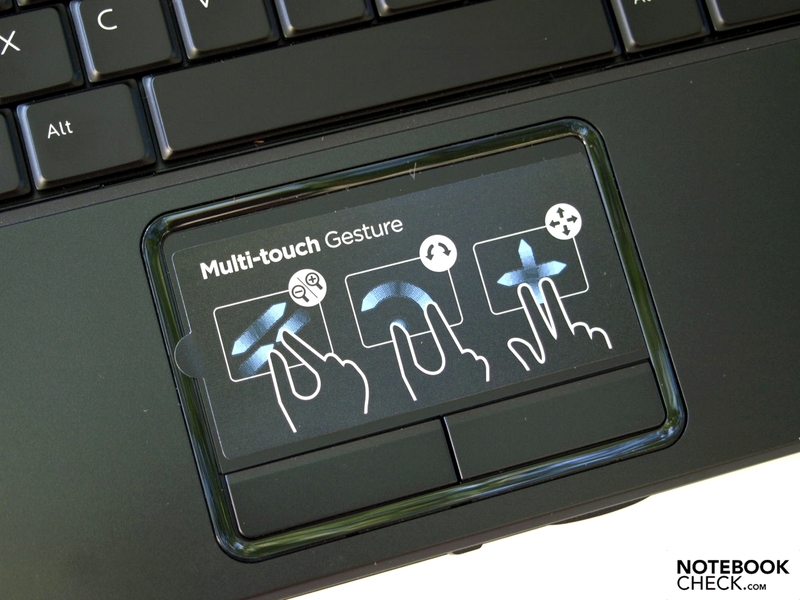 The gliding characteristics on the touchpad surface are excellent, and control of the cursor is precise. Should the touchpad not be needed it can be disabled by using the Fn+F6 combination. Even the medium length strokes - which respond evenly over the whole surface of the touchpad - can’t be criticized. 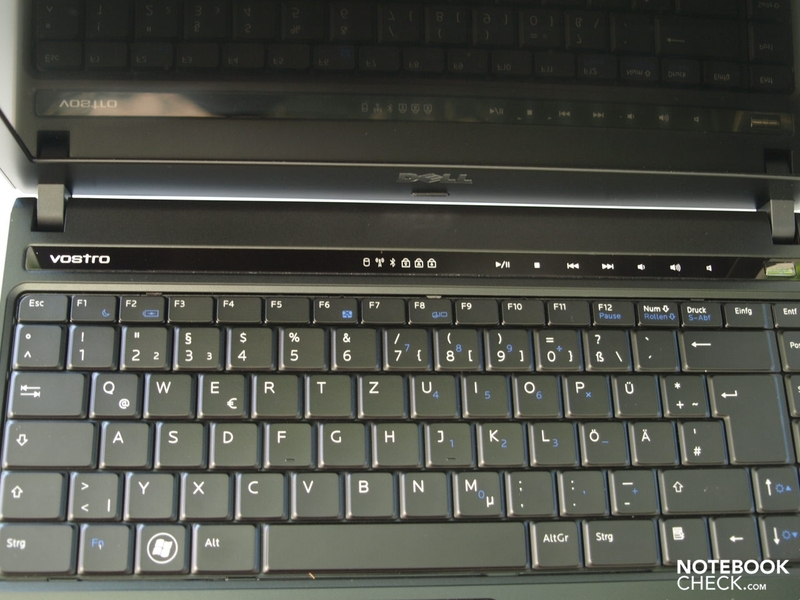 Dell has opted for a 13.3 inch size display with LED backlighting for the Vostro 3300. In detail it is a AUO112C from AU Optronics. 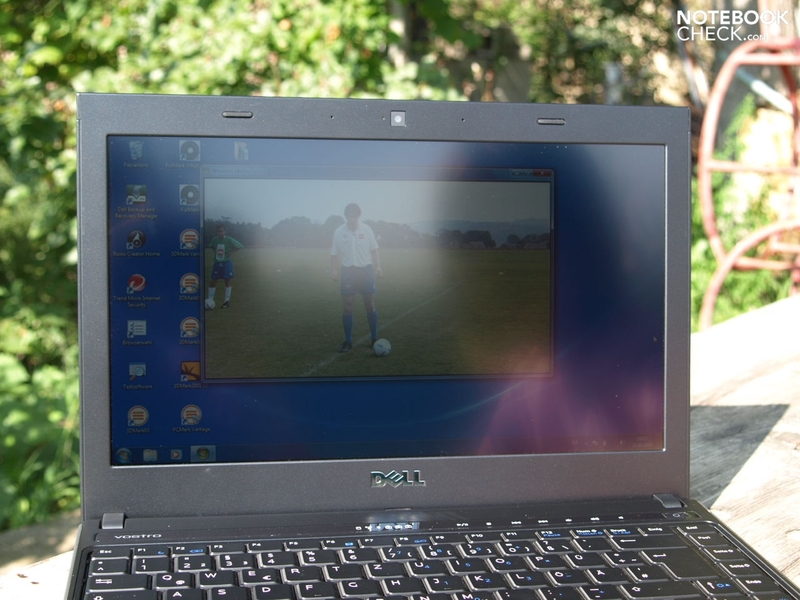 Typically for a business device the surface has been fitted with anti-reflective coating. The maximum supported resolution for the screen is 1366x768 Pixels, which is a cinematic 16:9 format. Considering the laptops size this can hardly be criticized. Now we come to the measured values of the display. These tend to be somewhat worse than with the Vostro 3500, although it will suffice for use indoors or in the shade. The maximum brightness of 198 cd/m² was recorded in the middle-left image segment. On average there are at least 183.3 cd/m², with a minimum of just more than 167.2 cd/m². Therewith, the test machine achieves a good and relatively equal luminosity rate of 84%. Furthermore, no shadowing can be detected with the naked eye. Due to a high black level of 1.15 cd/m² and the brightness for white around the middle segment at 196.5 cd/m², the device offers a reasonable contrast of 171:1. Essentially, the display colour is suitable for an office use. Like with the Vostro 3500 you also have the option of working outdoors with the Vostro 3300. In any case, you'll have to limit yourself to the shade. In direct sunlight you will be wishing the brightness level was just a bit higher. With strong light from behind you can encounter diffuse reflections depending on the angle. Nevertheless, these are hardly annoying and can by no means be compared to those observed on glossy displays. An excellent viewing angle is achieved horizontally. Typically for notebooks viewing is narrow on the vertical plane. Even small adjustments lead to a dimming, or alternatively to whitening. At even acuter viewing angles you will also detect color changes. Just like the Vostro 3500 the smaller Vostro 3300 is based on the HM57 (Ibex Peak) chip set by Intel. Accordingly, Dell offers potential buyers the choice between the Core i3 and Core i5 CPUs. The cheapest model is set up with just a Core i3 350M. 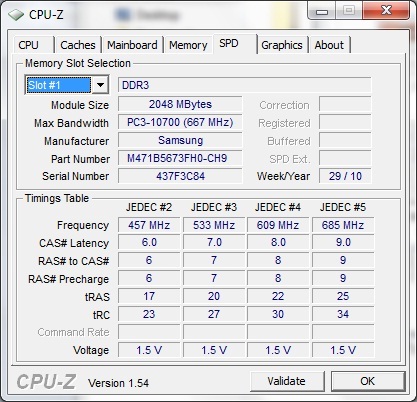 Our test candidate was fitted out with a Core i5 450m. 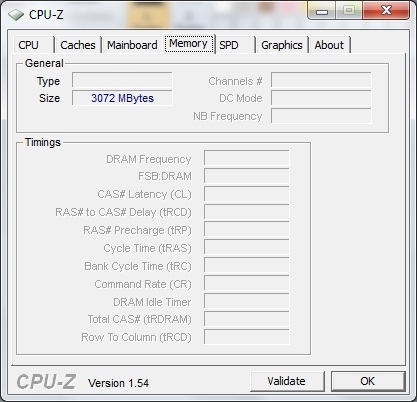 This is a dual-core processor, whose cores can be overclocked by the Turbo Boost technology. 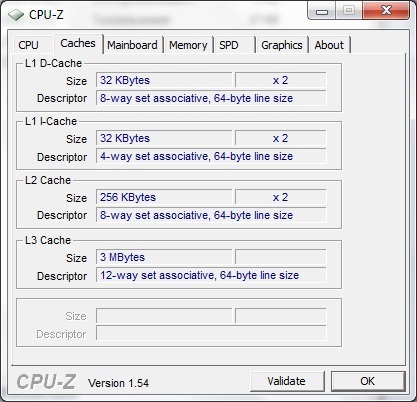 Due to Hyperthreading the processor can manage up to four threads simultaneously. 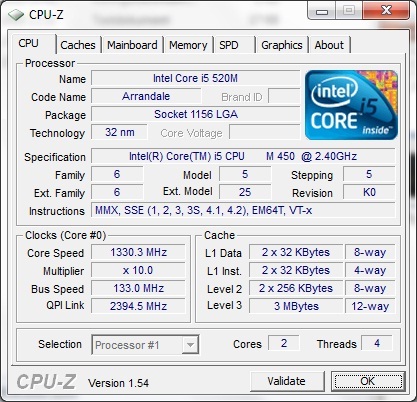 In comparison to more expensive Core i5 CPUs, such as the Core i5-520M, the AES functions are disabled and the clocking rates are somewhat lower on the Core i5-450M. The Intel Graphics Media Accelerator HD Graphics chip is integrated into the Core i Arrandale processors. Essentially, this is also the only graphics solution available on our test machine. 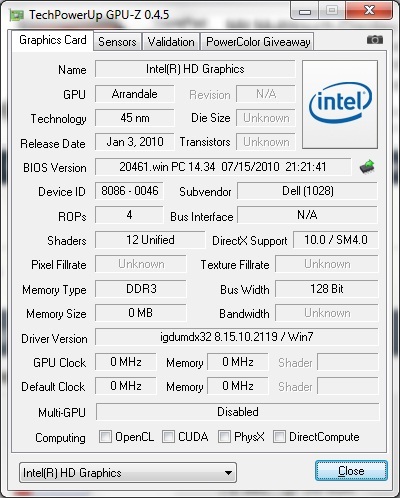 The performance of the GMA HD graphics chip is configured for office operations and light media usage (Video playback). 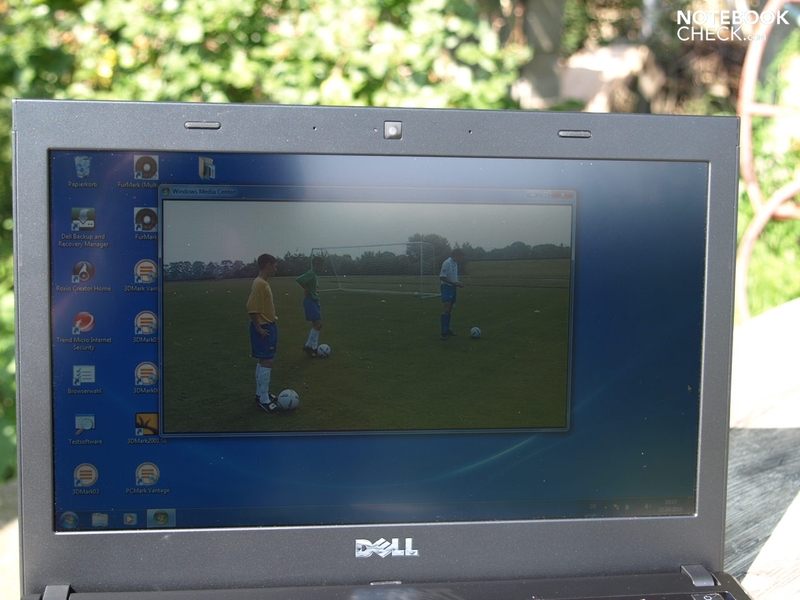 Therefore, it scores with regards to energy consumption and offers hardware acceleration for HD-Video decoding. MPEG-2, VC-1, and AVC are all supported in full detail. More expensive models offer hybrid configerations with dedicated GeForce 310M. In any case, the GMA HD Graphics chip will suffice office or internet use. Although the graphics performance with the GeForce 310M is, of course, significantly better, recent 3D-intensive games won’t playable at more than minimal, or at best medium details, and low resolution, so, it wouldn’t be recommended for demanding gamers. 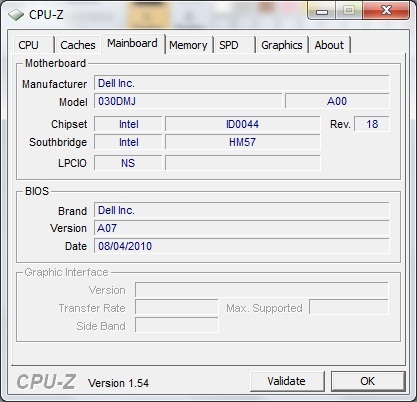 Details regarding the performance of specific graphics cards can be found in our section "Computer Games on Laptop Graphics Cards". Fn-Combinations have some negative impact. 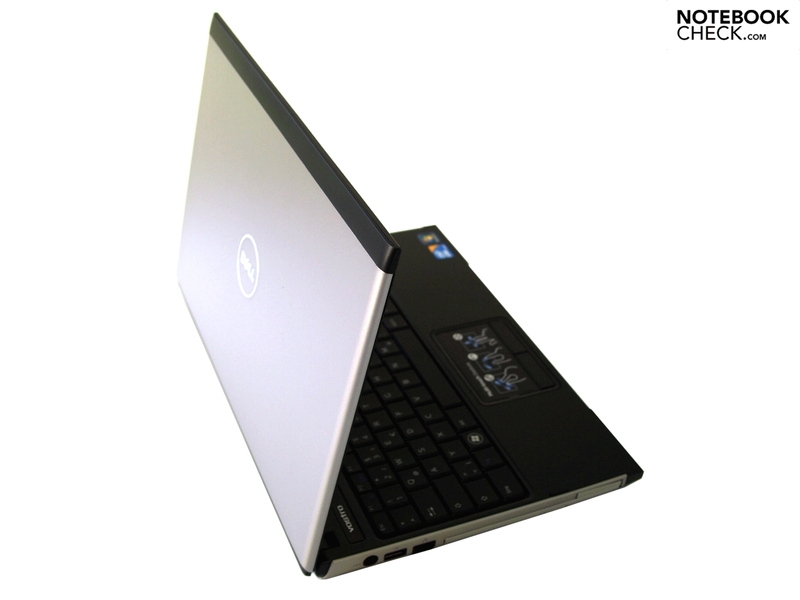 Dell offers the Vostro 3300 with 2 GB up to 6 GB RAM, while the HM57 chipset principally supports up to 8 GB RAM. Our test machine used three GB RAM. 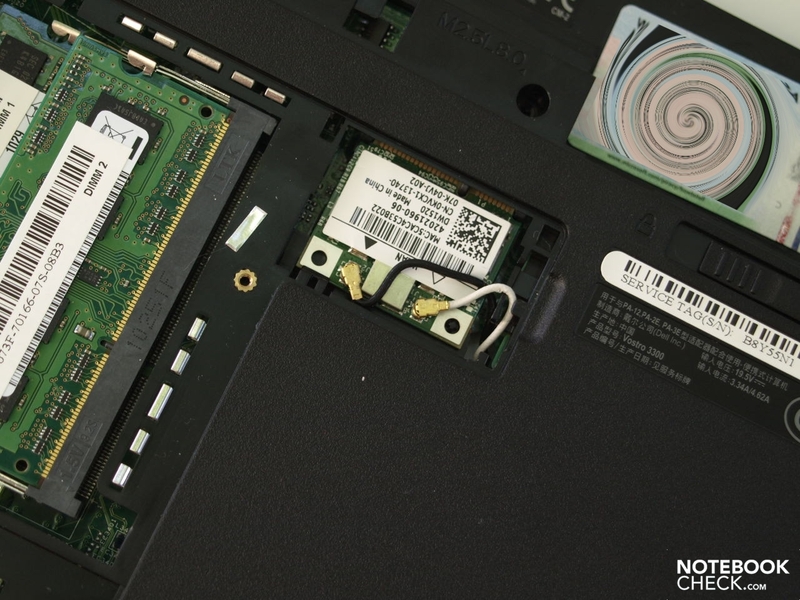 If that is to little, you can easily upgrade the RAM via a maintenance cover on the underside of the laptop. If you do, it is recommended to also change to a 64-bit operating system. 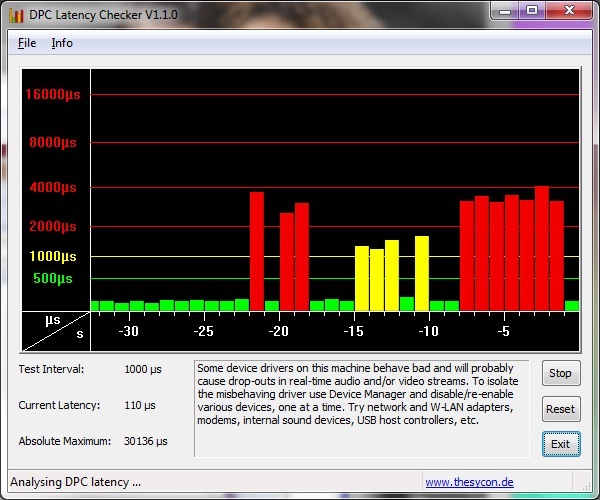 The DPC Latencies stay in the green zone for the time being. 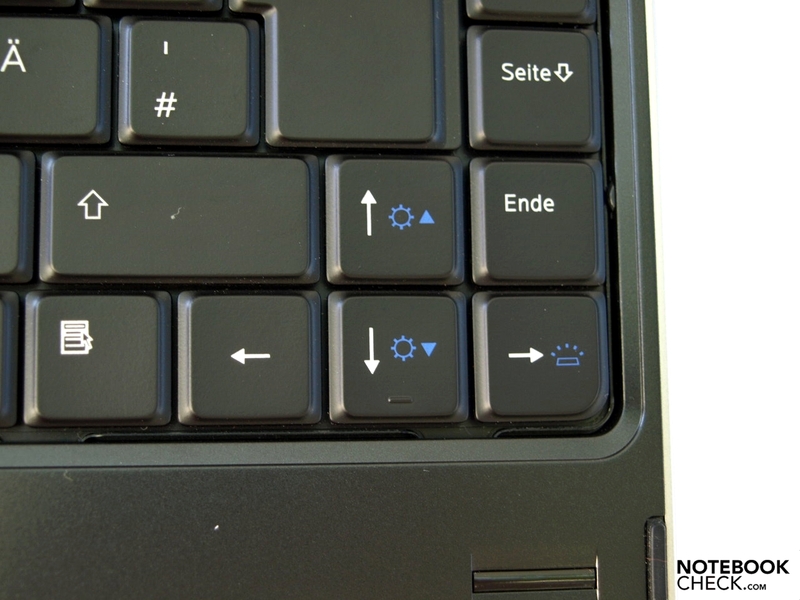 A move into the red zone can be achieved by using numerous Fn-Key combinations, in particular the keyboard lighting. Overall this shouldn’t present a problem, because they are usually not frequently used. Normally typing doesn’t have any negative impact on the latencies. Due to the somewhat lower clocked Core i 430M processor in the Vostro 3500, the Vostro 3300 under review performs somewhat better with regards to processor performance. However, the difference of +1% in PCMarkVantage, which evaluates the application performance, is negligible. If we compare our test laptop with other current business devices in the 13 inch range, the Fujitsu Lifebook S760 (GMA HD, Core i7 620M) offers a 14% higher overall score in PCMarkVantage. Examining the CineBench R10 Rendering results it achieved +18% in single-rendering but just +3% in multi-rendering. In contrast the Asus PL30JT-RO030X (GeForce 310M, Core i5 520UM) outperforms the Vostro 3300 by +19% overall according to PCMarkVantage. The Core i5 450M CPU (Vostro 3300) achieves significantly better results, when compared to the energy efficient Core i5 520UM CPU (Asus PL30JT), in the CPU-intensive tests. For example with Cinebench R10 it stood at +16% in single-rendering and +39% in multi-rendering. 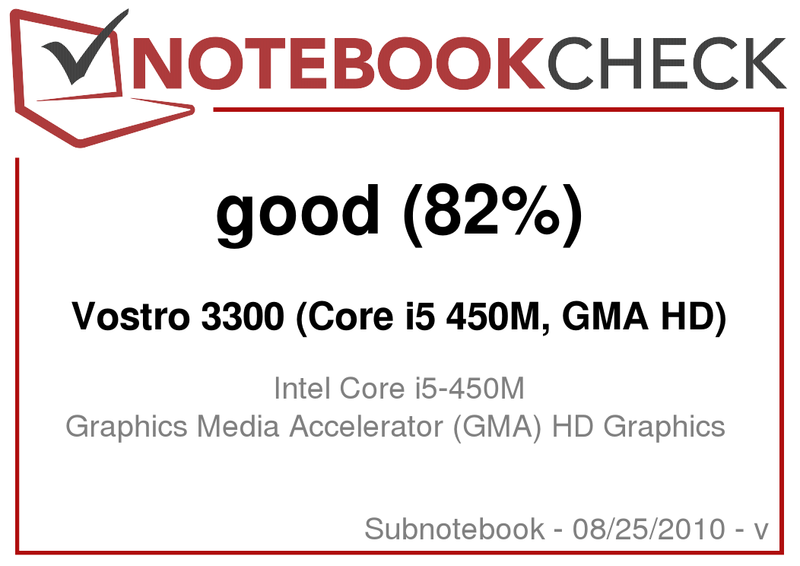 The graphics performance of the Vostro 3300 met our expectations of a device with intergrated GMA HD graphic chip. It reached a score of 2955 points on 3DMark05 and was outperformed by the Fujitsu Lifebook S760, which has the same graphics chip but has a higher end Core i7 620M processor, by 14%. 3DMark05 gives +23% for the Lifebook and +8% on CB Shading for the Lifebook. Despite dedicated 310M graphics card the Asus PL30JT-RO030X with Core i5 520UM performs worse in all the graphics tests. This could be because Asus have clocked down the graphics card. The already tested Vostro 3500, which features a dedicated GeForce 310M graphics card performs, as expected, significantly better in the graphics-intensive benchmarks. Practical gaming tests haven’t been performed, because there are already comprehensive test data of the GMA HD available in our database. 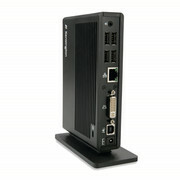 Furthermore, the Vostro 3300 is really more designed to be used with office and internet applications. There is also choice when it comes to the mass storage setup. 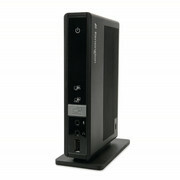 It has a SATA-Harddrive with 7200rpm up to 500 GB or a 250 GB 7200 rpm encrypted harddrive built in. The Free-Fall-Sensor and the "Strike Zone" shock absorbtion system provide data storage protection against shocks. 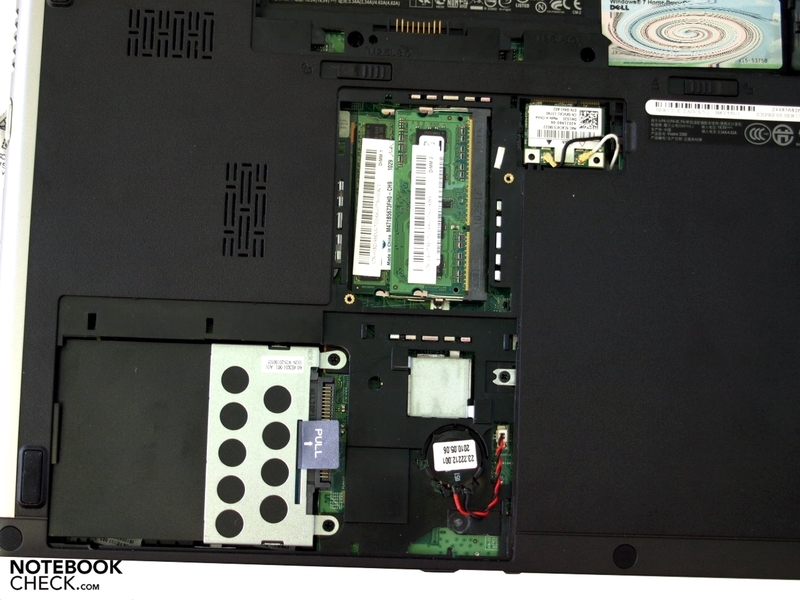 Our test laptop actually had a Seagate ST9320423AS with a gross capacity of 320GB installed. 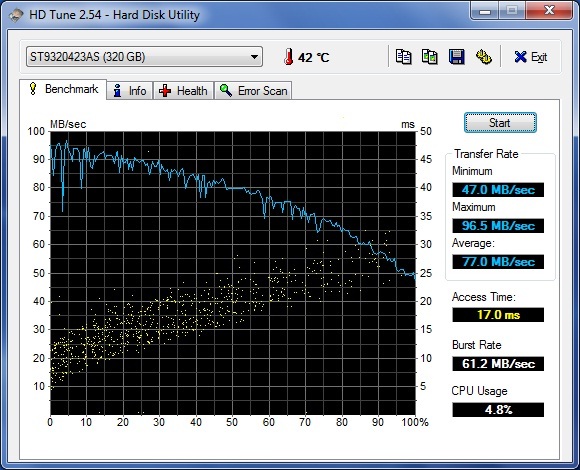 The performance rates recorded by the HDtune tool are in the same field as comparable 7200 rpm hard disks. 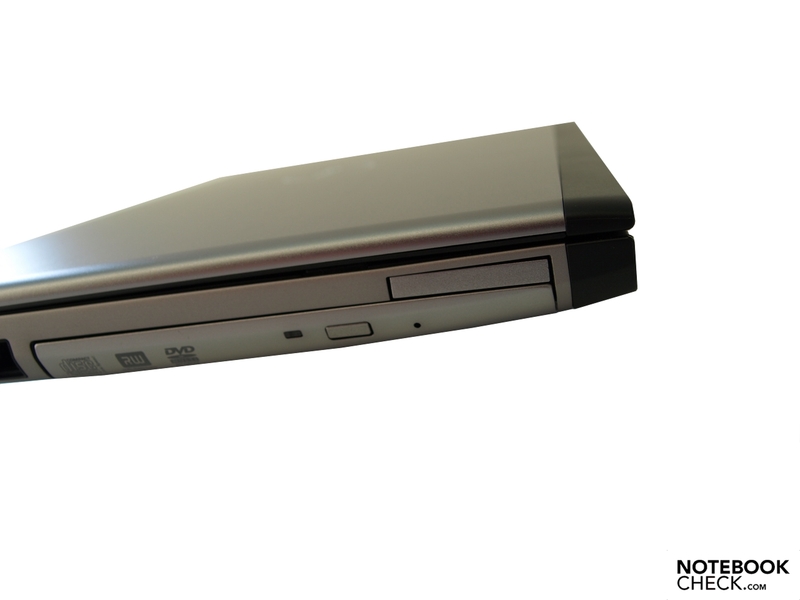 The optical drive available is a HT-DT-ST DVD+-RW GU40N burner. The tested Vostro 3300 remains pleasingly quiet under low load with a maximum of 35.2 dB(A). The fan mainly stays around a low 32.3 dB(A). However, when the load increases the noise level will rise as well. During our lengthy stress test eventually a maximum of 46.2 dB(A) was achieved. This is quite audible, but due to the low frequency of the noise it is relatively easy to cope with. There were no abnormalities in the fan controller observed during our tests. The temperature development is less pleasing. Under low load, when office application are run, a maximum temperature of 42.8 degrees celcius was measured. From the middle to the right and back the 40 degree barrier was passed, so that having the laptop on your lap can even in office mode be unpleasant. At least the top side remains at a reasonable temperature in the green zone. Unlike in operation under load. After a lengthy stress test we achieved maximum temperatures of 55.4 degrees Celsius on the underside and 47.2 degrees celcius on the top side. Here the right palm rest and the middle to right keypad area got noticeably warm. 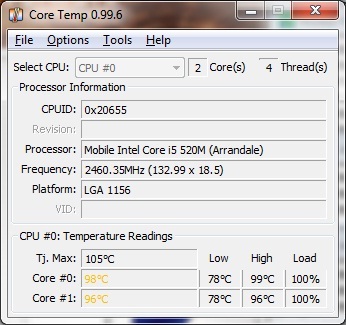 The CPU core occassionaly crosses over the 95 degrees celsius mark. 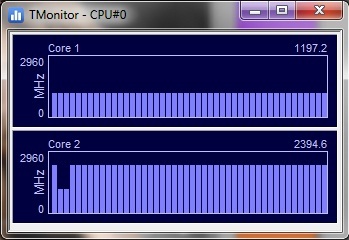 After a few hours, the TMonitor tool displays a permanent throttling of the first CPU core. Anyway, a 3DMark06 test executed straight after the stresstest shows there is hardly any difference compared to the cold test. (-) The maximum temperature on the upper side is 47.2 °C / 117 F, compared to the average of 35.8 °C / 96 F, ranging from 22 to 57 °C for the class Subnotebook. (±) In idle usage, the average temperature for the upper side is 32.7 °C / 91 F, compared to the device average of 30.7 °C / 87 F.
(-) The average temperature of the palmrest area of similar devices was 28.6 °C / 83.5 F (-9.8 °C / -17.6 F). An appealing sound is naturally not of utmost importance for an office laptop as it is with multimedia laptops. The Vostro 3300 features just the single loudspeaker located in the front left area of the base unit. Stereo sound is naturally not possible. As expected the sound spectrum lacks bass, although treble and middle layers appear to be comparatively balanced. At any rate, for background music, i.e. for presentations, the sound will suffice. It remains clear and undistorted both for maximum volume levels, and the maximum volume suffices use indoors. The reviewed Vostro 3300 is equipped with a lithium ion battery with just 40 Wh capacity. 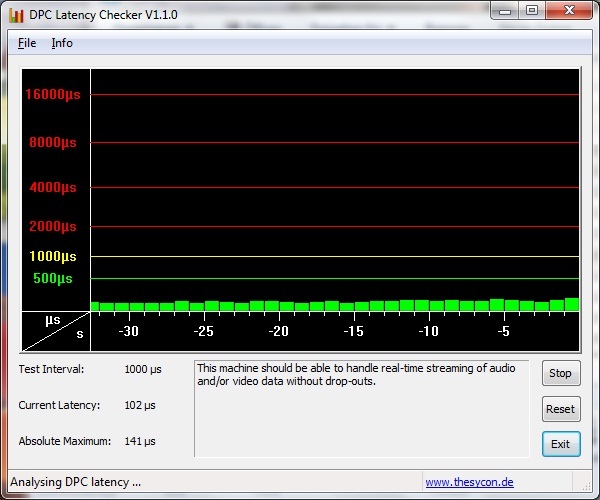 The BatteryEater Reader’s test recorded a maximum runtime of 3 hours and 45 minutes. This is with minimum brightness, the wireless module disabled, and the energy saving profile activated. Our internet research via WLAN came to an end after around two and a half hours with maximum screen brightness and the enery saving profile activated. In our DVD test with performance profile and maximum screen brightness, we could watch a movie for about one and a half hours. The BatteryEater Classic Test simulates load. At maximum brightness, with high performance profile activated and the WiFi modules turned on it records 55 minutes. Overall, the Asus PL30JT-RO030X can achieve significantly longer battery runtimes, basically, because it comes with a 84 Wh battery, which is slightly more than double the capacity. 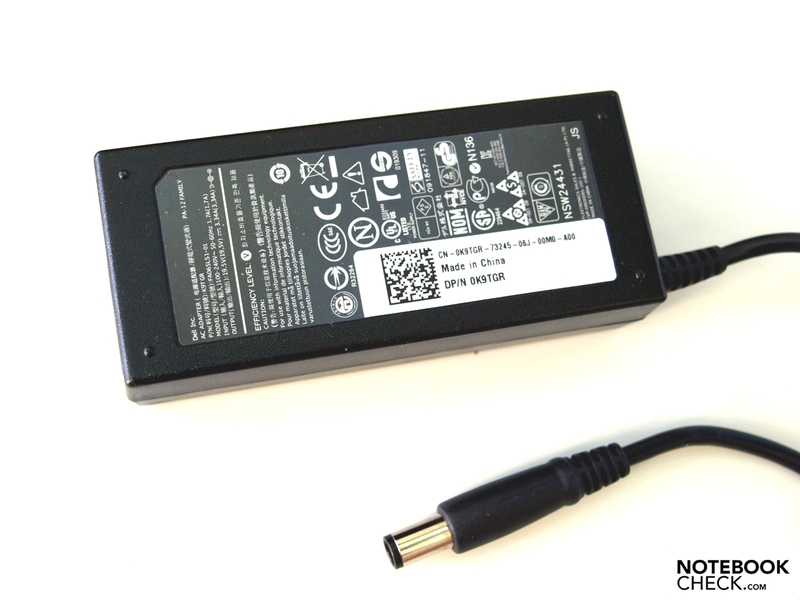 The Fujitsu Lifebook S760 (GMA HD, Core i7 620M) has a 62.64 Wh battery. Because, it needs more power in the practical scenarios, the battery runtimes relative to battery capacity are slightly shorter than of the Vostro 3300. Optionally, although not found in the online shops for Germany and Austria, there should be an 8-cell battery available. In the USA this can be ordered in addition as the main battery for $99. According to the manufacturer this protrudes the bottom by ¾ inches (or 1.905 cm). Power consumption in class comparison, green? It isn’t just the elegant design of the Vostro 3300 that appeals, but the case, which uses aluminium generously, convinces by workmanship and sturdiness. The laptop gets points with its good communication configuration and its good application performance. Outdoor use with the matt display, having good brightness, isn’t a problem in the shadows at least. The shock protected hard disk and the splash water protected keypad protect against data loss in the case of one or the other mishap. For a 13 incher the interface layout is alright. However, a separate docking port and a digital image interface directly on the casing would have been desirable. Overall, Dell has managed to create a starter business package with comprehensive features at a low price. The Vostro 3300 can also be extensively configured to suit personal performance requirements. For instances there are models with dedicated Nvidia GeForce 310M graphics cards available, although you won’t surpass the lower midrange even these. Good communication configuration and application performance in an elegant case. Other 13.3 inch business laptops at a low price with up-todate hardware. The Asus PL30JT-RO030X, the Fujitsu Lifebook S760 or even the new MacBook Pro 13 with reflective screens are significantly more expensive.